Duplicate Image Finder finds duplicate images on your computer. DIF compares images like you do: it compares 'what they look like' on the screen. Duplicate Image Finder can match up resized images, different filenames, or images in a different file format. Duplicate Image Finder compares JPEG, BMP, GIF, WMF, ICO, TIFF, and PNG files. Once found, you can delete, move, and view your image files. ...... You can then delete, move, or view the duplicate images. Duplicate Image Finder is very fast and easy to use. Duplicate Image Finder comes with an install/unintall program. Duplicate Image Finder analyzes the following types of files: JPEG, BMP, GIF, ICO, WMF, TIFF, and PNG files. 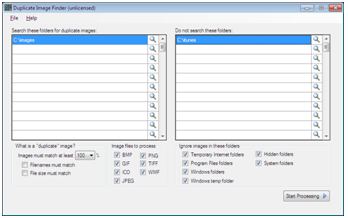 Qweas is providing links to Duplicate Image Finder 3.0.5 as a courtesy, and makes no representations regarding Duplicate Image Finder or any other applications or any information related thereto. Any questions, complaints or claims regarding this application Duplicate Image Finder 3.0.5 must be directed to the appropriate software vendor. You may click the publisher link of Duplicate Image Finder on the top of this page to get more details about the vendor.